Milestone, is excited to announce the release of GalexiTM CMS 6.0 – the next generation SaaS (software-as-a-service) content management system designed for the hospitality and travel markets. The platform provides several enhanced features and is optimized for conversion, usability and design. The technically sophisticated software platform is also search friendly and includes schemas for latest search algorithms. In addition, CMS 6.0 enables clients to develop Adaptive Responsive Mobile websites and has sophisticated social media integration features. The content management system has already been deployed across hundreds of hotel websites and is driving significant increases in traffic, revenue, and conversion for Milestone’s hotel clients. Galexi’s WYSIWYG (what you see is what you get) editor makes it very easy for hotels and brands to edit and manage their website. Galexi CMS 6.0 introduces several cutting edge features that enhance the conversion rates on the websites. The software enables pictorial drop downs, leading to higher website engagement by online visitors. In addition, hotels are now able to edit the banner marketing messages on the fly, as specials continue to evolve with seasons and time. The Content Management System also enables hotels to add unlimited specials and packages to their website with relative ease. Galexi CMS 6.0 follows Google Webmasters’ best practices for website development, leading to highly optimized websites that perform well on search engines and drive significant traffic (SEO Predictions for the year 2014 http://blog.searchmetrics.com/us/2014/02/03/seo-predictions-for-2014/). 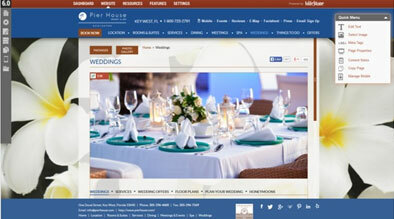 In particular, Galexi CMS 6.0 includes over forty different schemas optimized for the hospitality and travel segment. According to the latest study by Searchmetrics, more than a third of Google’s search results include schema-rich snippets. However, only 0.3% of all websites are using schema markups. Galexi CMS 6.0 implements schemas on websites, which are html tags that provide organized data to search engines, making it easier for them to understand the content on web pages and provide searchers with richer and more relevant results. Sites with schema tags can lead to enhanced SERP listings with rich snippets, which can increase click through rates by up to thirty percent. Galexi CMS 6.0 is designed and architected to lead to extremely low download times for the websites, which is also a critical factor for site performance. Galexi CMS 6.0 is at the cutting edge of the mobile technology revolution. As mobile continues to be the driving force in digital eCommerce and grows exponentially, Galexi CMS 6.0 ensures that businesses can have the most technologically advanced mobile websites. Galexi CMS 6.0 enables adaptive responsive mobile websites that are compliant with the latest search engine guidelines, and gives consumers the best mobile experience with quick download times, optimized information, and the most search friendly websites. Galexi CMS 6.0 offers a single interface for managing responsive websites for all screens types – desktop, tablet, and mobile websites. Galexi CMS 6.0 offers a seamless social experience for the consumers. Hotels are easily able to integrate the social media icons and social media sharing tools, such as +1s or likes, within any of the pages, or easily integrate videos and photos from social channels. In addition, Galexi CMS 6.0 integrates the ability to manage Facebook pages from within the software, and integrates with MediaConnect360 to offer broadcasting of messages to multiple social media channels. Galexi CMS 6.0 is amongst the industry’s most sophisticated SaaS based Content Management Systems. 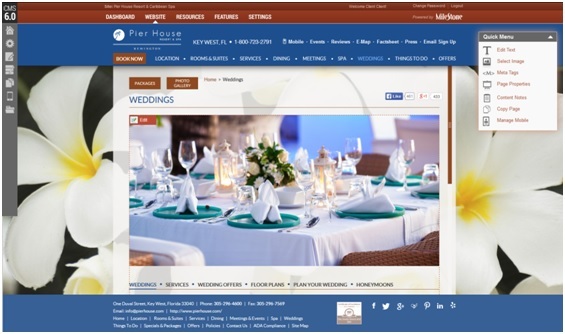 Its sophisticated technology and optimization for search, mobile, social, and conversion results in best-in-class websites that drive significant traffic and revenue for the hotel business. Click here to get details and pricing about the platform.